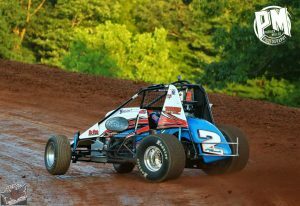 June 29, 2018 – It was wingless night at Lernerville Speedway. Very hot. A total Scorcher. Frankly, it’s been like that for the past week. But oh well, better than snow. Anyway… The travelling BOSS Wingless series came into Lernerville. A race that only happens once a year. I take a ton of pride in this specific race because it lets me show case my abilities driving without the wings on. We won this race in dominating fashion last year and I wanted to win by more this year. We made big changes after the hotlap session. It paid off and we won the 8 lap heat race by over a straightaway. I pulled to start outside pole for the feature and my focus set in. The green flag dropped and by lap 5, I had a straightaway lead over the 24 car field. I wasnt challenged and I wasnt even driving hard. Unfortunately, the RR shock broke when I hit the cushion on lap 6. It caused the car to bicycle. i was able to save it and bring it back down on all 4 wheels but the speed carried me out over turns 1 & 2. 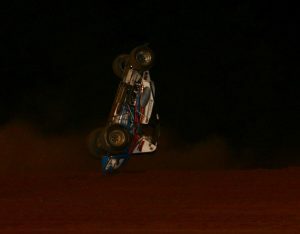 I tried to bring the car back up on the speedway but the wheels caught the grip and rolled me over lightly. We came in and made some quick repairs and I got back out for the green flag. The car still had issues and kept wanting to roll over to hard on the RR making me flip. After another red flag on lap 12, I came back into the pits for more work. While we were in the pits, an official came over to us and stated we were not allowed to come back into the pits for a 2nd time as it was against their rules, a rule that was not mentioned to us in the drivers meeting and it forced us into a DNF. There were only 13 laps left but I know we had the car to get us back to the front. Our 2018 hopes were spoiled but it only gave myself and the crew more drive for 2019! June 30, 2018 – We re-prepped the car to go race with the wings on. We were headed to Sharon Speedway in Hartford OH. About halfway there, our truck broke down and started throwing engine codes. We think it has some sort of relation to the heat we were experiencing. Nonetheless, we were forced to limp back home and work to find a replacement tow vehicle. 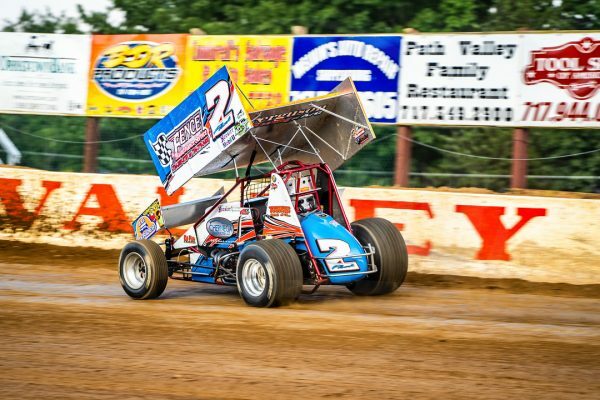 July 1, 2018 – The big Path Valley Speedweek race was July 1st and we stayed up all night calling around to find something. It didnt look very promising. Around 9am on Sunday morning, the guy that bought our street stock from us when we moved up to sprints in 2014 called and offered his 3500. it was gas powered so we weren’t sure it would haul as well but we gave it our best. I changed the car setup over to a 1/4 mile setup and the crew put a gooseneck attachment in his truck. We were on the road by noon. We got there safely and relaxed in the shade until the races began. A solid 16th place qualifying lap started us 3rd in the heat race. We raced up to 2nd by bottom feeding. Started 11th and flirted with the top 10 for all 50 laps of the feature before settling for 12th. I raced with and passed Christopher Bell, Rico Abreu, Greg Hodnett, Lucas Wolfe, and Tim Shaffer. All are incredible drivers and we ran wheel to wheel with them. It proves we have the ability to race against these guys but just need to gain their seat time and knowledge. One day, we will be up front winning the big races. There is no doubt in my mind. It is 4:45Pm on Thursday. I began this post at 4pm. Between my work and typing, I am finally getting this post complete. 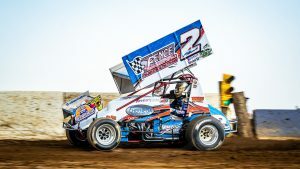 We still dont have a diagnosis on the truck but we do have a lender to get to the races this Friday and Saturday. The Jason Johnson passing is a heartfelt reminder about the dangers of our sport. Ill cherish the moments I got to race against him and Bryan Clauson.